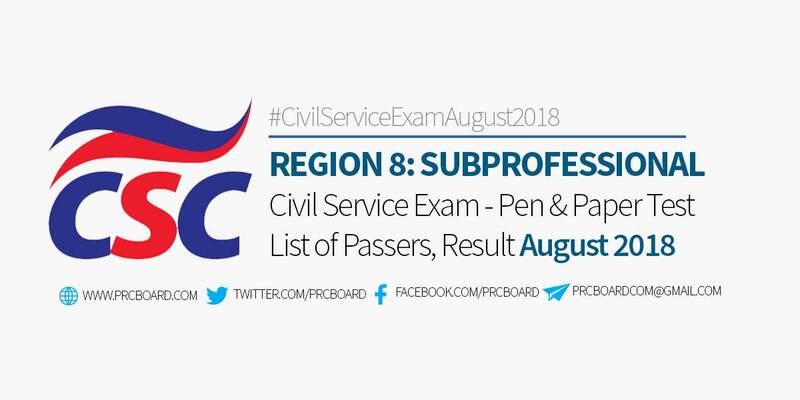 MANILA, Philippines - The Region 8 Passers Subprofessional Level in Civil Service Exam (CSE) conducted on August 2018 including the full results, top examinees and other important announcements are released by the Civil Service Commission (CSC) within 41-60 days after the eligibility exams. Below is the complete list of passers for August 2018 Civil Service Exam - Subprofessional Level in Eastern Visayas (Region 8), courtesy of CSC. CSE-PPT for Professional and Subprofessional levels are eligibility exams conducted by CSC twice a year to cater the growing number of individuals who wish to serve in Philippine government. The exams are administered by the Civil Service Commission on August 12, 2018 at CSC testing locations around the country specifically in NCR, CAR, CARAGA, ARMM, Ilocos Region, Southern Tagalog Region, Bicol Region and all Regional testing centers nationwide. To keep updated on the official result of Civil Service Exam August 2018, we advise our visitors to bookmark this page, visit CSC official website, follow us at our social media pages via Facebook and Twitter or join the members discussions at our Facebook Group.